Suffer from dark circles or puffy eyes? Tired of looking tired? Want to banish the bags under your eyes? Puffy eyes result when eye tissue retains fluid, either due to genetics or to controllable factors such as too much alcohol, salt, allergies, even the position you sleep in. Here are a few clever tips keep dark circles and puffy bags at bay…. Dehydration actually causes eye tissue to retain fluid, while drinking enough water signals your body to release it. Limit sodium, as it encourages fluid retention, so do artificial sweeteners and decaffeinated drinks. Reduce your alcohol intake as too much heavy alcohol drinking causes dehydration. Sleeping in eye makeup can irritate your eyes, causing fluids to pool. That weakens the delicate skin around the eyes, making it more likely to sink into a pouch. Make sure you get plenty of sleep not getting enough sleep can contribute to under eye bags. Your sleep position may be contributing to under-eye bags. Thanks to gravity, sleeping on your side or stomach can encourage fluids to collect under your eyes. If you’re a side sleeper, you may notice a heavier bag on the side you sleep on. Try to sleep on your back and place an extra pillow under your head. Always wear a sunscreen, as ultraviolet rays damage skin and contribute to the problem. Apply an eye cream to the eye area nightly. Gently tap your skin with your ring fingers when you’re applying eye cream to encourage the excess fluid to drain away. The skin around your eyes is extremely delicate so be gentle. Dark circles and eye bags are often linked to food allergies or intolerance, so if more sleep makes no difference, try cutting out wheat from your diet. Remove foods such as bread, pasta, cakes and biscuits entirely from your diet for 7 days and you should see a minor change. If you can cut them out for 30 days you would definitely see a major improvement. 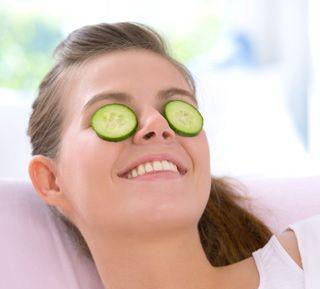 • Place cold spoons, slices of cucumbers, chilled tea bags, or even a package of frozen peas under your eyes. • Place thin strips of potato underneath your eyes to reduce swelling. The starch in the potato seems to tighten the skin. • Store eye creams in the fridge as the coldness will help to reduce the puffiness. • Apply cold tea bags to closed eyes for 10 minutes. Reduce with caffeine and tannin contained in tea bags will help reduce swelling. • Soothe with rosewater: Soak 2 cotton pads in the anti-inflammatory liquid and apply to closed eyes for 10 minutes.